There is nothing more flexible than a piece of paper, a pencil, and the human brain. Once you begin using a computer for hull shape design, you are forced into the limitations and idiosyncrasies of the program and its underlying hull geometry technique. In exchange, however, you get the following and more. Is the geometry accurate enough for construction use? Renderings may look good in a brochure, but the 3D model used to generate the rendering may not be accurate enough for construction purposes. Most rendering programs hide unfairness in curved surfaces because they process the surfaces into triangles and the shading routines smooth the triangles to hide their edges. This article discusses some of the flexibility you give up and some of the difficulties you encounter to take advantage of these benefits. These are the "dirty little secrets" that most designers learn about only after they buy and start to use a hull fairing program. Designers should also know more about the tools they use and understand what restrictions are placed on them by the program's user interface and what restrictions are placed on them by the underlying NURB hull geometry. The field of geometric modeling is huge. Two-dimensional vs. three-dimensional geometry, wireframe vs. surface vs. solid modeling, relational vs. parametric vs. variational geometry, parametric vs. implicit equations, the list goes on. This article, however, will talk only about smooth curved surface design using NURB (Non-Uniform Rational B-spline) surfaces, since that is the dominant mathematical technique used by most hull design and fairing programs, such as AutoShip, FastShip, MaxSurf, Nautilus, and ProLines. It is also the dominant technique used by general-purpose CAD programs, such as Autodesk's Mechanical Designer, Intergraph's Solid Edge, Trispective's 3D Eye (all ACIS modelers), and McNeel's Rhino. If you wish to transfer exact 3D hull geometry to other CAD programs, you will have to use NURB surfaces (or a surface type which is mathematically compatible with NURBs). For example, there are several companies (MolyCAM, Lite System (1995), Formglas) that will take your computer-generated hull shape and numerically cut a plug for the hull out of foam using a very large milling machine. These machines are controlled by one of several surface NC programs like SmartCAM and MasterCAM using NURB surfaces. You will have to provide them with a file containing the NURB surface definition in a standard transfer file format, such as IGES (Initial Graphics Exchange Specification). NURBs are the best techniques available for curve and surface design, but you have to understand their capabilities to get the most out of your boat design and CAD software. NURBs are Non-Uniform, Rational, B-splines. They are equations used to define curves or surfaces that simulate the designer's batten in terms of stiffness and continuity. In the early 1970's, 'B' or Basis splines were created (There are an infinite number of splines.) as a convenient way to define smooth curves and surfaces interactively on the computer screen. Rather than have a curve pass through a set of points, like ducks on a batten, a B-spline creates a curve which is "influenced" by the positions of defining points called vertices (see figure 2). The designer changes the shape of the curve by changing the positions of the defining vertex points. A curve influenced by B-spline vertex points is smoother than a curve passing through the defining vertex points, but the curve is by no means automatically fair. You can create some pretty ugly curves and surfaces with B-splines. In general, all flexible curve and surface modeling programs need some form of fairing tool. A NURB surface uniquely defines every square inch of a rectangular-like spline membrane. For editing purposes, it is usually represented on the screen by drawing a grid of lines on the surface called rows and columns. Like the NURB curve, the surface is defined by vertex points which do not lie on the surface, but are organized as a rectangular matrix or grid of vertex points. To understand and use NURB surfaces effectively, you need to know what controls you have over their shape: vertices, degree, knots, and weights. Programs might hide this terminology from you, but you need to know how each of these variables affect the shape of a curve and surface. It is more difficult to get the surface to be positioned exactly where you want. The vertex mesh hides the shape of the surface. Another approach is to use edit points which lie on the surface. For every defining vertex point "floating in space" there is an associated point which lies on the surface. Some programs allow you to control the shape of the surface using these points instead of the vertex points. The two common ways to implement shape control using points which lie on the surface are local control and global control. Local surface control using points that lie on the surface means that when you move a point on the surface, it is guaranteed that the change affects the surface only in a small area surrounding that point; the same as moving one vertex point. (see figure 5) The problem is that when you move one of the points on the surface using this technique, some of the surrounding defining points on the surface also move! This technique is the same as moving a vertex point, except that you are moving the associated point on the surface. Global surface control means that when you move one of the defining points on the surface, none of the other points on the surface move. This is called a full NURB surface interpolation technique. (see figure 6) As the selected defining point moves, the entire surface shape is affected, although the shape change decreases dramatically as you move away from the changed surface point. Although the surface interpolation approach is global, it gives you the most accurate, direct control over the surface. This is because you control the shape directly and only the selected defining point moves. Vertices or surface points can be positioned anywhere in space and are the major shape control factor. For fairing and detailed shape control, you need to learn more about the following variables. The highest exponent used in the polynomial (3 in this case) is the degree of the polynomial. NURB curves use one type of polynomial and NURB surfaces use two different polynomial types (one for each grid direction - row/column). The higher the degree of the polynomial, the more flexibility there is in the curve or surface, but the more wiggles it might have. Cubic, or degree 3 polynomials are considered to have the best trade-off in flexibility and stiffness. It is the degree used most often in CAD programs. Quadratic or degree 2 curves and surfaces will be stiffer and will be automatically more fair than cubic curves, but the range of shapes they can achieve will be much more limited. Many CAD programs fix the degree to always be 3. NURB curves and surfaces are polynomials pieced together using knots or a knot vector. Curves use one knot vector and surfaces use two; one for each grid direction. The knots define how the polynomial pieces are blended together with the proper smoothness. Most programs give users only indirect control over this shape factor. It is also the cause of many curve and surface shaping and fairing problems. A uniform knot vector (with constant spacing between the knots) is the most common technique and works best for most situations. A program may automatically adjust the spacing of the knots in the knot vector (non-uniform spacing) to account for uneven spacing of the rows and columns of the surface, but this may cause problems with adjoining surfaces. Some programs also use knots to define tension or knuckle control over the surface. The problem with knots is that they have a semi-global effect on surface shape. If you adjust the knot spacing in the row direction, then the surface shape is changed for the full length of the surface, affecting several columns. In addition, if there is a surface attached to the end of the rows, then it must use the same knot spacing to maintain exactly the same edge shape. This is a major problem with knots. Not only do they have a global affect on the surface, they can also force changes in adjoining surfaces! Many programs avoid these problems by fixing the knot spacing to be uniform for all surfaces. This is a reasonable solution, but it means that the user should create surfaces with evenly spaced rows and columns. Weights - For NURB curves and surfaces, each vertex point has an associated weight value that affects the shape locally near that point. This weight value is the result of the rational aspect of NURBs, which means that the equation is defined as a fraction or ratio of polynomials. The purposes of the weights are to allow for exact descriptions of conic shapes and to add more user control over the shape of the surface. Although each vertex point has its own weight and although each weight has a local effect on the surface, a change in a vertex weight (1.0 is the default weight) does not necessarily change the surface the way you want. In practice, changing a vertex weight value can cause more problems for fairing. The best approach is to apply weight changes only near the end of the design process to achieve very specific local effects. Do not use weight control to create shapes that can be achieved by moving vertex points. Some CAD programs severely limit the user's control over weight values because of these problems. Most hull shapes can be defined and faired without changing the weight values. Now that you have been introduced to the NURB shape controls (vertices, degree, knots, and weights), the next section will discuss many of the hull design problems that you may encounter and some of their solutions. Some of the more insightful readers might note that if a program uses uniform knot spacing and fixes the weights to 1.0, then this would be a simple uniform B-spline curve or surface. Then why does a CAD program use NURBS? That is a good question and I can make a good argument that NURBs are not necessary, even for conic shapes. I guess the reason is that NURBs form a superset of many different spline techniques and that if you wish to transfer surface geometry between programs, then it is a good solution. These are some of problems you can expect when using one of the hull design programs. The NURB surface is a rectangular mesh of rows and columns with four hard corner points. The entire surface is continuous, except for these four points. You can stretch and distort the surface to any shape by repositioning the vertex points, but the more non-rectangular of a shape you make, the more difficult it will be to fair. It is the designer's job to determine how to break down a full hull surface into a collection of rectangular-like pieces, how to deal with the four hard corner points, and how to maintain the proper continuity between surfaces. There is no one way of doing this. For example, a full keel, wineglass shaped, sailboat hull is one of the more difficult shapes to define. The hull is not rectangular and is difficult to model with one surface. Figure 9 shows how the J Boat Endeavor I was modeled by one NURB surface because the aft end of the keel made a smooth transition up to the transom. Even so, there are many subtle shape problems that have to be dealt with due to the extreme distortion of the one rectangular surface. Another approach is to pretend that the keel is not there and describe the whole canoe body as one NURB surface. You would then create a second surface to define the keel, but you would have to attach the upper edge of the keel surface to the canoe hull with the appropriate continuity. This technique works best for fin keels, rather than for full keels. Still another approach is to define the hull and keel with one surface from the bow to the back edge of the keel. Then you would add another surface to define the counter of the hull from the aft end of the keel to the transom. You could even overlap and attach the surfaces to try and maintain some level of continuity between surfaces. 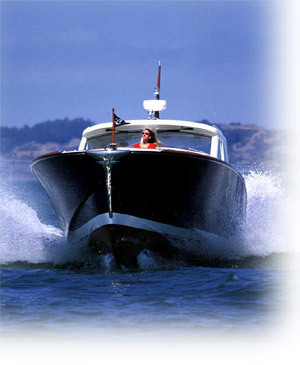 These fitting and shaping problems are encountered in all types and sizes of boats. Since the defining vertex points (the ones that you have to grab and move) do not lie on the NURB surface, most programs allow you to connect the vertices with straight lines to make them more visible. This grid of straight lines is often called a vertex mesh. If you do not connect the vertices with a mesh, then the vertices are floating in space and it becomes very difficult to know which part of the hull they influence, especially in section view. If you display the vertex mesh, however, it clutters up the screen and hides the shape of the hull. To avoid this problem, some programs use points which lie on the surface of the hull. This cleans up the clutter and makes the hull easier to see and manipulate. NURB surfaces are defined using a grid of row and column vertex points that can be moved anywhere. You cannot directly grab and alter the shape of any traditional lines of the boat, such as waterlines, buttocks, and diagonals. These lines are considered to be derived lines or surface cuts which can be automatically calculated from the surface definition. Some programs, however allow you to display these lines while dragging a control point so that you can immediately see what happens when a vertex point is moved. To change the shape of a waterline, for example, you have to move the vertex point which lies closest to the point on the waterline you wish to change. This is the biggest adjustment required by the experienced hand draftsmen. One can start with a very simple NURB surface consisting of two rows and two columns, and then add in additional rows and columns to increase the flexibility and control of the surface. In doing so, the program must add the row or column in over the entire length or width of the surface. There is no allowance for partial rows or columns. This means that if you want to add rows and columns near the bow to define a bulb, then these rows and columns must extend over the entire length and width of the surface, whether you want them to or not. Remember that the only way to add shape control is by adding in control vertices, and the only way to add in control vertices is by adding them in as a complete row or column. The smoothest surface shape depends on a relatively even spacing of the rows and columns. If there is more than a 2 to 1 ratio of consecutive row or column spacing, you will begin to see some very strange anomalies, such as hard bumps and loops. A program could adjust the knot vector to minimize the bumps and loops of uneven spacing, but this adjustment can cause other difficulties. For example, if two surfaces are to be joined exactly, edge-to-edge, then the two surfaces must have the exact same knot vector at that edge. If you have several surfaces attached together with common edges (like most multi-chine vessels), then a change in the knot vector in one surface can affect the shape of all of the connected surfaces. One technique in dealing with attached surfaces is to use uniform knot spacing and always add in rows or columns by splitting the difference between two existing rows or columns. This will always maintain a reasonable 2 to 1 ratio in row and column spacing acceptable for uniform spacing. Rarely can you use one NURB surface to define a whole boat. If chines and deck edges form the edges of the NURB surfaces, you need to understand the requirements of attaching two surfaces together. There are two types of attachment: exact and approximate. To form an exact attachment between two surfaces, at a chine, for example, the two surfaces must match up exactly along their entire length. The common surface edges must have the exact same edge vertex points, they must use the exact same polynomial degree at the edge, they must use the exact same knot vector at the edge, and they must use the exact same weight values at the edge. Otherwise, the mathematical definition and therefore, the shape of each surface at the chine will be different. If the two surfaces do not agree exactly at the common edge, then the attachment is considered to be approximate. It is then up to the user to manually make sure that the two approximate edges are within building tolerances of each other. If two surfaces match exactly and the user adds a column which runs into the attached surface, then the program must add a column to the attached surface or the two surfaces will not be joined exactly anymore. The original goal of B-splines was to create smooth curves and surfaces interactively on the computer screen. That is why they use vertices which do not lie on the curve or surface. But these floating vertices make it difficult to recreate shapes that currently exist. For example, if you have a table of offsets and wish to create a NURB surface representation of that shape, you will have difficulty trying to position the vertices to achieve that shape. Some programs allow you to digitize the sections of an existing boat and to use that as an interactive guide for moving vertex points. You move the vertex points until the surface section shape matches the digitized station shape. This is a very tedious process. A better approach is to automatically fit the NURB surfaces to the offset data or the digitized stations so that the surface passes through the offset points. You will still have to perform the final shaping and fairing, but the matching-up time will be greatly reduced. For those interested in scanning in a bodyplan of a boat, it is not quite that simple. Most bodyplans consist of overlapping stations which cause a problem when the scanner program tries to convert the scanned-in black dots to form polylines which represent unique stations. You end up spending a lot of time in your CAD program fixing up the mistakes. In spite of what you may have heard, there is no mathematical definition of fairness. This does not mean that everyone would disagree on the fairness of a curve or that there are no mathematical tools to use to check for bumps and wiggles. It just means that there are no good ways to automatically fair a curve or surface by computer without some form of human input. For example, one of the tricks in fairing a manual spline is to lift certain ducks for a moment to "relax" the batten. This smooths the curve, but it doesn't necessarily maintain the shape that you want. With the computer, you have the same problem of getting the shape you want and making sure that the shape is fair. Automatic computer fairing techniques may smooth a surface, but they do not have the human judgement to make this shape vs. fairness trade-off. Some programs say they guarantee fairness of a curve or surface, but this is only an opinion and is done by severely limiting the shape of the surface. For example, if someone gave you a batten and three ducks, it would be difficult to create a curve which was not considered to be fair. On the other hand, you would be severely limited in the range of shapes you could draw. Most hull design and fairing programs provide ways to check the fairness of a hull by using some form of second derivative or curvature curve, and by using some form of surface curvature color mapping. Designers don't need to know the mathematics behind these techniques, they just need to see how the technique magnifies all bumps, wiggles, and inflection points. The designer interactively changes the shape of the hull to obtain a smooth derivative or curvature curve. As you can see, the designer is actively involved with the fairing process. The problem with fairing NURBs is that the surfaces are so sensitive to the knot values. If a program uses uniform knot spacing, then the NURB surfaces need to have fairly evenly spaced rows and columns. When the knot spacing does not match the spacing of the rows and columns, you will have fairing problems. When a NURB surface is stretched into a very non-rectangular shape, even non-uniformly spaced knots do not help. In addition, non-uniform knots cause other problems, as mentioned before. Another problem is that you cannot control the shape of the lines (waterlines, buttocks, etc.) directly. You can only change the shape of the rows and columns of the surface. In practice, it is relatively easy to obtain the station and buttock shapes you want, but the waterlines will always be a problem. The reason for this is that a waterline cut through the surface does not typically relate to either a row or a column on the surface. This means that to shape and fair a waterline, you need to change the shape of both the rows and the columns. Depending on the shape of the boat and how much the NURB surface has been stretched to fit the hull, you will have a greater or lesser problem with the waterlines. Part of this problem has to do with how hand draftsmen cheat when they draw the lines of a boat. The goal of traditional hand drafting is to match up the different views of the lines and to fair the lines at the same time. For most cases, fairing the lines wins out over making sure that the three views of the lines match up exactly. For good draftsmen, the errors in matching views are within building tolerances. For NURB surfaces, however, all three views always match exactly. You cannot cheat just to get a waterline or buttock to look good. In addition, the programs can "cut" any waterline or buttock, so it is easy to evaluate the full 3D shape of the boat. You cannot gloss over the very subtle shape problems commonly found in waterlines. What makes it worse is that the surface curvature display tools can magnify every last little bump and wiggle, so it is impossible to fair a surface perfectly. Your goal should be to fair the boat to within building tolerances and not to worry about how perfect the lines look. Although weights have a local influence on the shape of the surface, manipulating their values can be difficult. A common approach is to try to obtain the desired surface shape by only adding and manipulating rows and columns of vertices. After you have roughed out the hull shape, you can then change the weight values to achieve specific local effects. Most boats, however, can be defined without changing the vertex weight values. Only experienced users should try manipulating these values. There has been some discussion between two ways of attaching or connecting surfaces: trimmed surfaces vs. relational or attached surfaces. For trimmed surfaces, one surface is pushed through another and the program automatically trims off the overlap. An example of this is to push the top of a fin keel through the bottom of a canoe body of a sailboat. For relational or attached surfaces, the top edge of the keel surface is attached to the canoe body of the hull. If the top of the keel is changed, it will always stay attached to the hull, and if the hull changes shape, the top of the keel will stay attached. The obvious advantage of attaching one surface to another is that you do not have to worry about whether the surfaces intersect if one or the other surface changes shape. The downside is that if the attached-to surface changes shape, then the attached surface changes shape. For the keel and canoe-body attachment example, if the hull changes shape near the keel, then the attached keel changes shape. For airfoil-shaped keels, you do not want a change in hull shape to change the shape of the keel. Likewise, if you attach a cabin top to a deck and then decide to shift the cabin fore or aft while still attached, then the cabin top will change shape. For trimmed surfaces, you would just have to make sure that the cabin sides penetrate the deck surface by a little bit. The shape of the cabin top is independent of the shape of the deck. You can "pick up" the cabin, shift its position, and set it down on the deck (penetrate the deck) without changing its shape. There are benefits and disadvantages to both approaches. Attachment or relational geometry works best when the two surfaces or geometry shapes relate and are dependent on one another, such as when you attach longitudinal stringers to the inside of a hull. Trimmed surfaces work best when the two surfaces must be joined, but their shapes are independent of each other. Trimmed NURB surfaces also work best if you need to convert the surface model to industry standard solid modelers. Relational attaching of one surface to another can leave very small gaps between the surfaces which are very difficult to deal with in solid modelers. All of the hull design programs use open surface design geometry. None of the programs use solid modeling, which requires a complete, closed solid geometry at all times. Solid modeling has some advantages when it comes to calculations, but it makes the process of modeling the geometry much more difficult. This means that the boat design software has to do a lot of work to calculate the hydrostatics and stability of a vessel. The first step is to cut all of the surfaces at a series of station positions along the length of the hull. The next step is to somehow combine these surface cuts into realistic, closed station shapes. This can be very difficult for intersecting and open surfaces, and for surfaces that do not quite match up exactly along common edges. Once legal station shapes have been formed, the program can use the desired waterplane to clip off their above-water portions. Finally, some form of longitudinal integration can be performed to produce the final results. For all of these programs, the key to obtaining accurate results is to verify the final shapes of the cut stations before the calculations are done. If the stations look good (and you have enough of them covering the length of the vessel), then the results should be accurate. Be aware that many problems can arise during the station cutting and reconstruction phase. NURBs are the dominant mathematical technique used for designing curves and surfaces. In spite of this, there are many things you need to know to get the most out of your hull design or CAD program. This article discussed many of these hidden problems. Since all NURB-based programs vary greatly, the best advice is to get the demos of all of the boat/ship design programs and spend some time with them trying to design and fair a boat. The user interface of a program can have as much of an impact on your ability to get the job done as which mathematical technique is used to define the hull. Don't wait until after you buy the program to learn the truth.